Infiniti Centre Newcastle is hosting a 'Grand Prix' weekend offering people to chance to watch the Hungarian Grand Prix live from the Hungaroring on a big screen. Prior to the race starting boss of the Infiniti Red Bull racing team Christian Horner will join guests for a live interview direct from the circuit, being conducted by BBC Radio Newcastle sports commentator Mick Lowes. 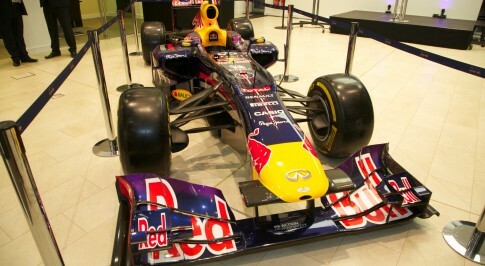 An Infiniti Red Bull F1 racing car, as driven by Sebastian Vettel and last year's Hungarian Grand Prix winner Daniel Ricciardo, will be on display, together with Ricciardo's racing overalls and other driver memorabilia. In addition to the prestigious racing car, guests will have the opportunity to test their own skills with driving simulators and reaction timing machines and to view the impressive Infiniti range. Vertu Motors PLC has opened Infiniti Centre Newcastle, which is the tenth Infiniti Centre in the UK and the first in the North East. The centre, located at Silverlink Retail Park in Newcastle, covers the areas of Tyne and Wear, County Durham and Teesside. Amongst other models, Infiniti Newcastle is selling the recently launched Q50, a premium sports saloon packed with leading edge technologies alongside a full hybrid version designed with both performance and efficiency in mind, and the QX70 dynamic SUV.